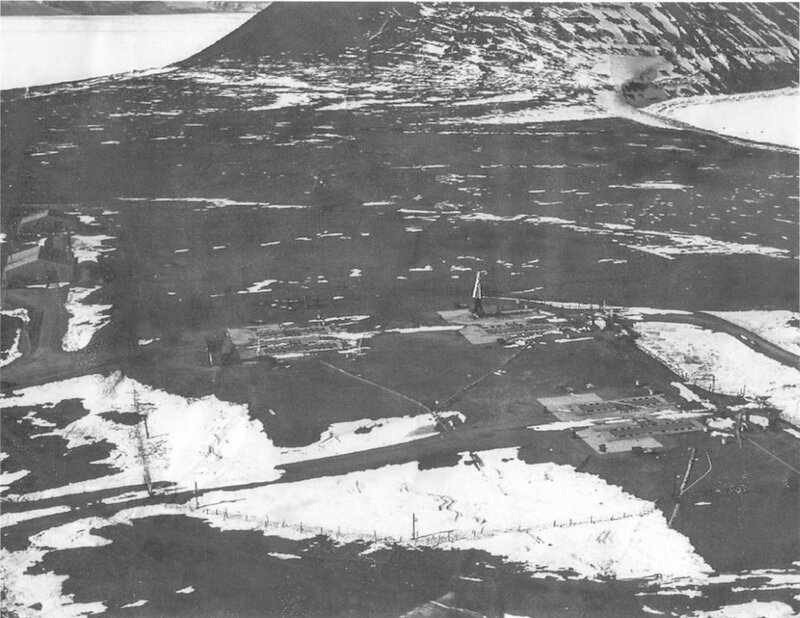 An aerial photo of the launcher site at Battery A in Thule where I was stationed. It shows a missile raised on the launcher during AG tests. To the extreme left of the picture are the assembly and warhead buildings. In the left background the large white area is North Star Bay, frozen over, and the hill to the right is Mount Dundas with the shore line of, I believe, Baffin Bay. During the dead of winter there was an ice road across North Star Bay. Military personnel were banned from driving over it and we were to go up, over, and down the other side of North Mountain, which took considerably more time. I only went to Thule Air Base about 6 -10 times during the year. It was quite a trip, about an hour on ice covered roads. One can see the missile up to receive AG at, I believe, B section. A section to the left had the guard tower built above the entry. It looked like an ATC tower, with windows all around, plus the ADT alarm controls were there and each section was connected by PA and we had field phones also. The guard tower would be manned 24/7 unless we had a Phase, a wind storm consisting of straight line winds possibly up to 200 MPH plus. My section to the lower right was C section. With a magnifying glass you might be able to make out two figures standing on the opposite side of the launcher to the right of the booster. I think one of them is me, as I remember going topside one day to watch the AG calibration being done. I volunteered, actually pre-enlisted, before my 18th. birthday and when that came along I was gone. At that time the army had a guaranteed enlistment program, either the duty station or training school of one�s choice. I chose to go to Homestead AFB in South Florida. Unfortunately when I was at Jacksonville Naval station doing my paperwork I was informed there were no vacancies at the sites there. So I agreed to go to Air Defense School at Fort Bliss Texas after basic training, hoping there would be an opening there when I finished school. One morning during roll call formation, the corporal made announcements that the persons whose names were called had dental appointments. My name was called and my reaction was �Why do they need to check my teeth again ?� When the corporal handed me my appointment slip I saw in the bottom left corner, printed in capital letters, in red indelible pencil, and in parenthesis, (THULE). I read it as "thool." The corporal quickly corrected me, saying it is pronounced "Too-lee". My next question was "Where is that?" "Up north", he says. Thule Greenland, approximately 750 miles above the Artic Circle. Needless to say that was quite a shock to a young man from central Florida. I would not have missed it for anything. Being in the military was probably one of the best things I ever did. I returned stateside in 1965 and was stationed in the St. Louis Air Defense Command. I was at a base in Pierre State Park in Illinois on the Mississippi River . Came back home in Sept. 1966.